There’s no skimping on quality at this excellent little fish‘n’chips restaurant that does les anglais proud. 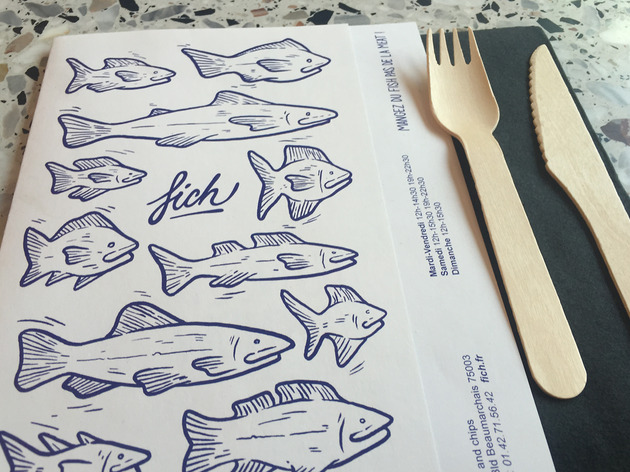 The name might be a contraction of ‘fish’ and ‘chips’, but there’s no skimping on quality at this excellent little restaurant that does les anglais proud. 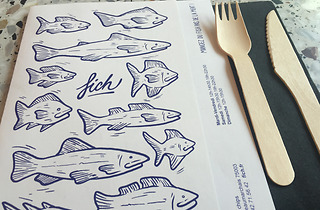 Seating around 20, come here to gorge on fish in all its forms: in burgers (with cheddar and courgettes, €10), in salads (€13) and of course fried with mushy peas. The décor is bright and on-trend with ocean-blue walls and a mural frieze by hip local illustrator Yesonme. At lunch, €15 will get you a scrumptious portion of fried fish, chips (add €1 for the sweet potato version), a drink and mushy peas. The batter is crispily perfect, with just the right amount of unctuous oiliness – and while the portions aren’t enormous, the chocolate desserts should sort out anyone with an appetite for full-on indulgence.